We have put together a Mixed Meat Box for February filled with delicious local beef, chicken, pork, and turkey. A variety of cuts for a variety of meals, and even some winter grilling! Plato Dale Farm 100% grass fed beef is the anchor for our mixed meat box! Red Gate Grocer out of Ithaca offers quality meats from small, local farmers. Their sliced bacon is uncured with no nitrates or nitrites. Minimally processed, without the use of preservatives or other artificial ingredients, Murray’s Certified Humane Chicken is raised without the use of antibiotics, growth drugs or hormones. Murray’s chickens have plenty of access to fresh air and sunlight. Ground turkey is from Stonewood Farm – all natural, no hormones or antibiotics. Our Italian sausage is made in house, by John Kudla. John has been making varieties of sausage for many years as Avenue Boys Sausage, selling at Elmwood Bidwell and North Tonawanda farmers markets. Now he is using his special recipes and making fresh sausage weekly here at the store, using locally grown pork from Dispenza’s Natural Meat Market in Ransomville, NY. Antiobiotic and hormone free. Murray’s Whole Chicken – approx. 3.5 lb. Housemade Cheese & Parsley Italian Sausage – 1 lb. 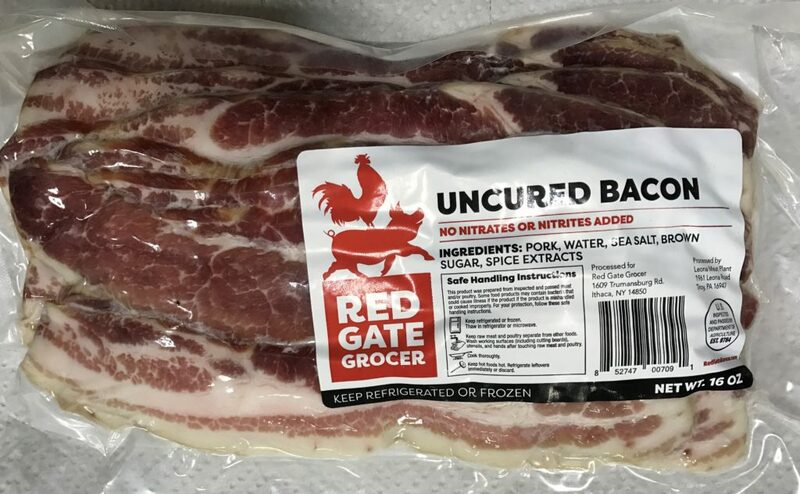 Sliced Red Gate Bacon – 1 lb. *All cuts of meat are frozen, except for the chicken. Order deadline: Monday, February 11th! Call us (633-2830), email (info@farmersandartisans.com), or stop in to place your order. Please no substitutions. Pick up date: Friday, February 15th 7am-7pm. Payment is due at pick up. Please make arrangements to pick up on Friday as we are limited by freezer space. Thank you!